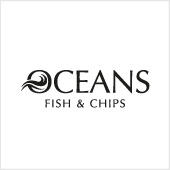 At Oceans Fish and Chips we source the best quality seafood and potatoes and cook them with care. We don’t add MSG or bulking agents to our food. Our ethos is to be committed to serving quality food and to be environmentally conscientious. Where possible we use certified sustainable seafood by the MSC and all our packaging is recyclable. So let each one of us do our part and support the sustainable use of renewable and recyclable resources. The store is located next to Burger King in the rotunda.